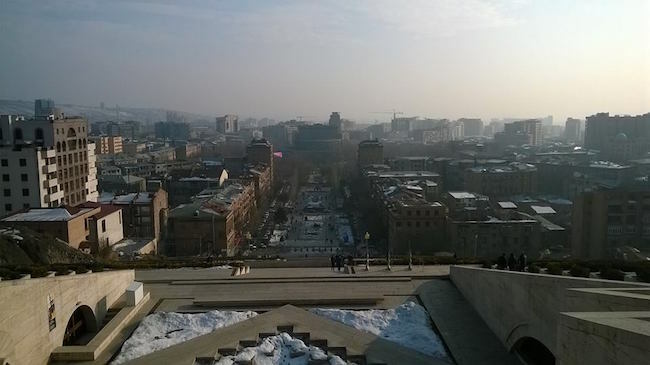 The hill of Tsitsernakaberd sits about two miles from Freedom Square and marks the point where the bustling hub of Yerevan gives way to the serenity of the city’s outskirts. If the traffic is kind it’s no more than 15 minutes by road from the Opera Theatre, the cultural epicentre of this ancient metropolis at the meeting point of two continents. The surroundings, though, could scarcely feel more disparate. In the first week of March 2017, Tsitsernakaberd is carpeted with snow, and when it catches the early spring sun it glistens. Over to the east, Mother Armenia watches over Yerevan, sword in hand, from her plinth at Victory Park, whilst a little more centrally the national stadium strikes its ungainly pose dug out of the Hrazdan gorge just near the river. It was here that, in October 1973, 70,000 people watched FC Ararat, a provincial football club from tiny Armenia, defeat Zenit Leningrad 3-2 to be crowned champions of the Soviet Union. This is a proud place. The Armenian national consciousness is forged from much suffering. At the top of Tsitsernakaberd is the country’s official monument to the dead of the 1915 Armenian genocide, that murderous crusade inflicted by a decaying Ottoman Empire upon 1.5million ethnic Armenian victims. Here, high above the city, the sound of the snow crunching under foot conjures a heart-breaking remembrance of men, women and children led from freezing Yerevan on death marches towards the Syrian desert. Between the Hrazdan Stadium and the Tsitsernakaberd monument there is a small sports complex; three artificial pitches with a few modest stands erected to accommodate a handful of spectators. Like at the Hrazdan, the seating is decked out in the red, blue and amber of the Armenian flag, and despite the small stature of the place these are good facilities, especially on a day like today when the cold conditions would have made a grass pitch unplayable. It’s on these pitches that FC Pyunik, the once-dominant Armenian Premier League club whom between 2001-2010 won ten consecutive top-flight titles, school their next generation. Whilst clubs the in the rest of Armenia are taking more and more to sourcing players from overseas, Pyunik have defiantly stuck to a policy of homegrown-only, even if this has meant a recent downturn in the league fortunes of the formerly perennial champions. The Pyunik School on a frozen Saturday marks the end point of a long personal journey. I first began trying to trace the founder of FC Yerazank several months earlier, via a protracted series of hopeful emails and calls placed to a vast Armenian diaspora stretching from Gyumri, near the Turkish-Armenian border, to New York. Only two days before arriving in Yerevan had I been able to finally establish his name and where in the world he was. Yerazank transliterates as Dream Team. In the 1980s, the club had held their own in the senior leagues of Soviet Azerbaijan despite being made up exclusively of teenage boys. When war broke out between the Azeri and Armenian regimes in 1988, Yerazank, an otherwise unremarkable club from the city of Stepanakert, found themselves at the centre. The conflict lasted six years. The sides fought for territorial sovereignty of Nagorno-Karabakh, a mountainous region in western Azerbaijan which, despite its historically Armenian population, had been placed under the jurisdiction of Baku by the early Soviet law-makers in the 1920s. As the USSR entered its final stages in the late 80s, Karabakh made a play for independence, and the subsequent Azeri resistance plunged the region into war. I almost lose my footing as I make my way down the icy steps that lead from the Tsitsernakaberd Highway to the cabin that houses the Pyunik offices. I am 45 minutes late. At the bottom, just at the far end of the car park, a blue-tracksuited man stands with his back to me, taking in whatever game is underway on one of the complex’s three synthetic pitches. He turns as I approach and watches me across the forecourt. As I come close he extends his hand and his lined face fixes me with a smile. “Eduard Bagdasaryan,” he says, softly. Six days and 4,800km from south Yorkshire, this is the man I’ve been looking for. In some sense, the young footballers turned soldiers of Yerazank were not much different to their compatriots who followed them to the frontline to fight the Karabakh war. Bagdasaryan, once of FC Ararat but forced by injury into early retirement, had founded the club in 1982, with the ambition, he says, of leading them to the Soviet Top League. When he first brought these players together, they were nine and ten years old. By 1987, they had reached the second division of the Azerbaijan league system, finishing 11th in their first season. When war broke out the following year, Yerazank were re-assigned to the Armenian championship, where they competed in the top-flight. They finished sufficiently high to gain admission to the first season of the independent Armenian top-flight when the football federation seceded from the collapsing USSR. By now the players were 15 and 16 years old, and not only thrust into the throes of top level, professional football, but also now carrying the flag for their homeland, which they had been forced to flee due to the fighting. Armenia, like Azerbaijan, was battered by the war. Somewhere between 25,000-35,000 lives were wasted and more than a million people displaced. It coincided with the country’s awkward transition from a stale but relatively stable communism, into the unpredictable waters of post-Soviet market economics. By some measures, the republic is still recovering from the trauma. The war also came at the same time as a devastating earthquake, which hit near the northern town of Spitak on December 7th 1988. Estimates put the death toll as high as 50,000. Armenia was rocked harder than at any time since the Genocide, and the sinews stiffened anew. When the call to arms came in 1988, most went willingly. The players of Yerazank were assigned to regiments across the region, and the club ceased football activities. Bagdasaryan’s application to join the armed forces, however, was denied. “I had five children, and when I went to sign up they said to me ‘no’. So I became a conditioning coach for the boys who did go to fight”. The assignment was a good fit. Bagdasaryan had been a father-like figure in his career as a football coach, so it made sense that his skills would best be put to use in whipping Karabakh’s young soldiers into shape when war broke out. Yerazank quickly became a microcosm of the conflict at large. The players – young and enthusiastic – had built the club from nothing, and against long odds had flourished in a testing competitive environment. Now their achievements became hostage to the vagaries of war; sporting camaraderie re-purposed for conflict, success on the football pitch downgraded and reprioritised. The Karabakh war hurt Armenia all over. Yerazank took its share of the blows. Loris Grigoryan and Ashot Adamyan were 18 and 19 years old respectively when they lost their lives on the front line. They had been with Yerazank from the start, helping the club from the amateur ranks into the senior leagues. Adamyan, with his classically thick Armenian brow and heavy dark eyes, was a lithe defender, whilst the boyishly handsome Grigoryan led the Yerazank line. As athletes, they embodied everything the club stood for; as young men, they were its ambassadors. “I had a call from Loris’s father on the final day of the battle of Shushi” says Bagdasaryan, pulling a large book from his satchel and leafing through it with quiet intent. “He asked me to try and persuade his son not to go to the battle. We had already won at Shushi by then and he wanted him to stay away. So I said to him ‘If it was you, would you stay away? Or would you go to fight?’ To that, he had no answer”. 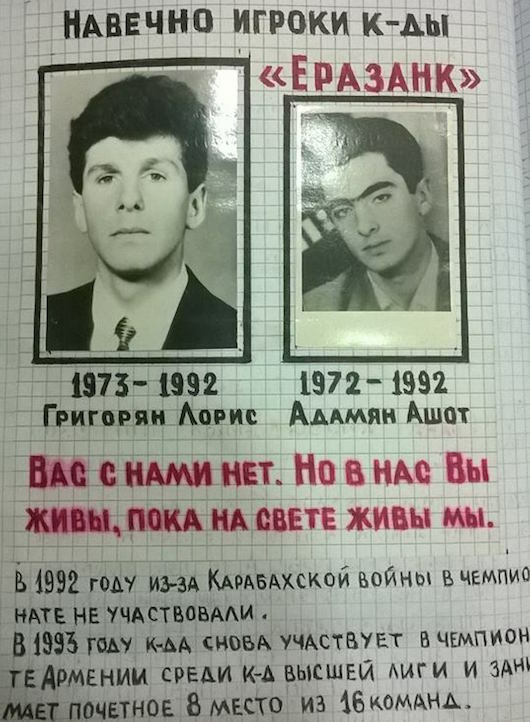 Grigoryan was killed at Shushi on May 9th 1992. Later that day, the last Azeri forces were expelled from the city. The coach stops flicking through pages and pushes the open book across the table. At the top, etched neatly in red biro, is the word Yerazank in Cyrillic script, and beneath it are two black and white photos, each with a thin black border. Both Grigoryan and Adamyan look business-like, dressed smartly in suits and ties, gazing just beyond the camera into some imagined future. Each picture carries a footnote; Loris Grigoryan 1973-1992, Ashot Adamyan 1972-1992. It’s the anecdotes, the flashes of character as told through a haze of time and half-remembered conversations, which bring home the sadness of what happened in this part of the Caucasus towards the end of the last century. Yes, the war was the great common denominator in Karabakh. But everyone experienced it differently. The FC Yerazank squad would regularly fly between Stepanakert and Yerevan on a group ticket with 22 paid-up seats. Grigoryan used to question Bagdasaryan why, when the plane departed with empty seats, he never sold the spares on to the black market, instead letting people who needed to travel take up the extra places for free. The club, after all, could use the money. It was the most minor disagreement, the old-headed coach versus the sharp-eyed youth pepped by Armenia’s barter economy. Thirty years later, it brings the black and white thumbnail of Grigoryan to life. His death suddenly feels immediate. Bagdasaryan reaches inside the back cover and takes out a folded newspaper clipping. It is from the day that Grigoryan and Adamyan were killed. The headline, roughly translated, reads ‘the dream dies’. For the first time since he introduced himself to me out in the snow, the old coach goes silent. 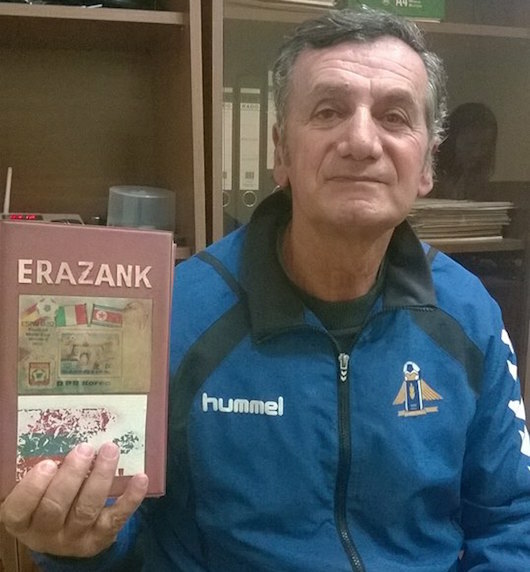 In 1993, Yerazank returned to top-flight football, still playing in the Armenian league but now based in Yerevan. There was stability, for a while, until the corrupt mess in Armenian domestic football finally caught up with them. The government in Stepanakert pulled funding for the club midway through the season in 2003, after the US-based financial backers began to exert pressure for the Nagorno-Karabakh republic to form its own independent league. Bagdasaryan suspects the real reason lies less with the concern for the formation of a Karabakh league, which never happened, and more in that the backers wanted to focus on their other major sponsorship interest, FC Ararat. Either way, Yerazank were on their own. In 2004, the call came from the club’s management, Karabakh defence minister Samvel Babayan, that Karabakh native Bagdasaryan was to be removed from his position as coach in favour of an alternative of full Armenian heritage. Without their founder, the club limped on for another two years, before folding in 2006. Bagdasaryan, so he says, walked away with his head high and a wry smile, his club picked apart by men who didn’t understand the game and whom he was certain would to run it into the ground in his absence. So it proved. “From then on, Yerazank stayed as a dream”, he says wistfully, closing his book and sliding it back into his satchel. It seems unintentional, but Bagdasaryan is a fine storyteller. Today there is no cross-border competition between Armenia and the rogue state Nagorno-Karabakh. An appeal made at the start of the last decade by the football authorities in Azerbaijan made sure of that in FIFA statute, and Karabakh’s isolation has been entrenched ever since. Bagdasaryan still works in football, coaching Pyunik’s young goalkeepers here at the academy, and it seems fitting that a man whose outstanding talents have always been in getting the best out of young players is working at a club where those players will get a decent crack at the first team. But things are not like they were. Pyunik, for all their titles, will never be Yerazank. That dream has been put to bed.